An ‘unholy alliance’ between politicians and gurus was primarily exemplified by a series of Indian Prime Ministers, Presidents and Supreme and High Court judges and other ministers and elite Indians who worshipped (and benefited from) super-rich Sathya Sai Baba. That the leaders of a major country could accept as genuine a man who claimed to be God the Creator of the Entire Universe (and much more besides!) is utterly reprehensible in itself. The more so because Sai Baba stood very credibly accused of serial sexual abuses against young male followers and of deep involvement in the murder by police of four of his followers in his bedroom in 1993, while being protected from any prosecution whatever by the Indian elite. This collusion between politicians must eventually go down in history as a massive indictment of that Indian elite which worshipped him uncritically and drew whatever financial and electoral benefits from his popularity. His riches depended largely on deceit - that is, bogus manifestations of purported holy objects such as ‘diamonds’ (which were all cheap synthetic gems provided by local jewelers) for devotees, who thankfully donated vast sums to him in return for these trinkets that they were told were holy and should never be doubted to be divine gifts from an invisible realm! 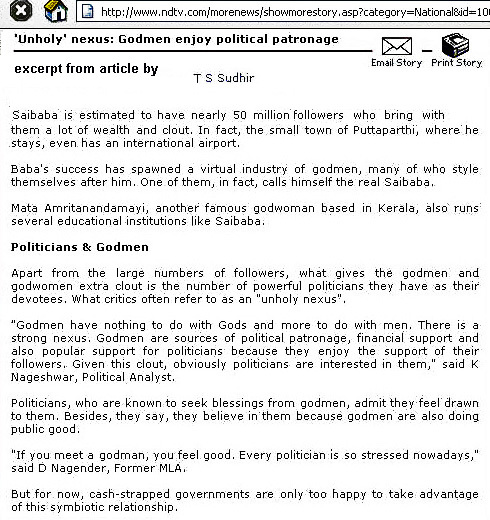 The ‘Unholy’ nexus between bogus ‘godmen’ and politicians was aptly described by a writer for ndtv some years ago, as seen in the scanned excerpt from his article shown here.